This post is sponsored by Earth Mama Angel Baby and Green Sisterhood. All opinions and thoughts are my own. The last thing anyone wants to think about is toxins when running on no sleep and dealing with a baby that has a diaper rash that is painful just looking at. 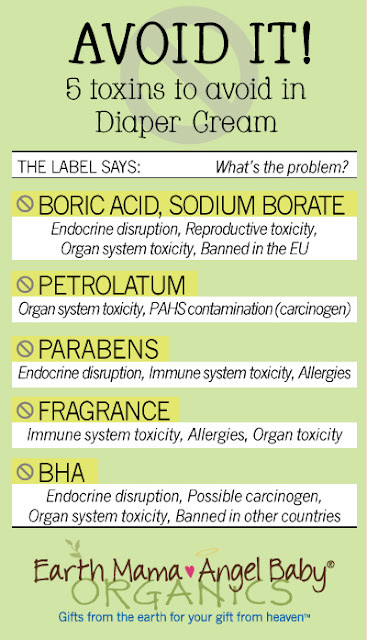 In fact, we should never have to question if there are any toxins in ANY product we are putting on our kids. Toxins do not belong in our kids products for so many reasons but one of the most important is because babies skin absorbs toxins at increased rates and since their bodies are not fully developed they can not detoxify these chemicals. Continued exposure to toxins can lead to chronic illnesses that will last a lifetime. Reducing your baby's exposure to toxic chemicals is no easy task. The key is to know what to avoid and use that information to find products that fit your needs. But let's keep is simple, because the more complex the solution, the less likely people are to seek out the safe products. Look for companies that are an open book. Ingredient lists should be readily available on company websites and directly on the products. You should not have to contact the company to obtain the list, they should only a few clicks away on their website. Steer clear of buzz words like "all natural" and "plant based" unless you see that the product is certified organic. Also, just because a label has nature-esk pictures on it does not mean that it is good for the environment or good for you. The best diaper creams are not always readily available in the drug or grocery store. Smaller companies tend to be more open about their ingredients, manufacturing processes and contain less toxic ingredients. But the downside is that they are not often the products that are sitting on the shelves of the stores we all frequent each week. There are a lot of really great places to buy products online and for smaller companies this often means you can buy direct from them. Buy based on the brand and product, not the location of where it is sold. Watch how your baby responds to the products you are using and if something, anything seems off them stop using them right away. Rashes and any crankiness they are experiencing from the rash should never get worse when using a diaper cream. Each child is going to react differently so just because one product has worked for your other children or friends does not mean that it will work for you. I don't know about you but in the 2.5 years B wore diapers I never did finish a tube of diaper cream. Kind of a waste of product and money. There are several products on the market that can be used for more than just diaper rash. The product that is currently in our home I actually bought long after B was out of diapers. I bought it because my green sisters told me that it was great on dry skin. And it is. It also is working on my crazy toe nail after I soak it in apple cider vinegar. What guided your decision on the diaper cream you picked? Does it contain any of the toxins listed above? Want to learn more about Earth Mama products and what they are doing to keep your kids safe? Check out this video by the Green Sisterhood. What a great resource! I used Earth Mama Angel Baby diaper cream because it WORKED and it was cloth-diaper safe. In fact, I like to keep a jar of it around for all sorts of "boo-boos" even though we're past the diapering stage. Great tip on Earth Mama being cloth-diaper safe! So many brands are not. I couldn't believe how well it works on cuts/scrapes etc. B's knees are always in bad shape from running/jumping/general superhero activities so I love that I can put a tiny bit of Earth Mama on it and heal them faster. I absolutely loved the Angel Baby Bottom Balm when my kids were babies (and still use it now). It definitely didn't seem like it would be safe with cloth diapers, but it was great. I used it on eczema too. Awesome stuff, especially when there is so many nasty products are out there. You know the first thing that I thought of when I started to use it was how easy it was to apply. Some of the "pastes" can be so thick and hard to rub in. So many parents do not know what to look for on the labels. This is a great resource for them when reading labels! We use diaper cream on tons of stuff in our house, with the sensitive skin types we have we need the most natural and safe products to keep us from reacting. I found that coconut oil was the best diaper "cream" ever, and safe for my cloth diapers. It can also be used for about eleventeen thousand other things around the house! I love coconut oil for shaving and as a conditioner!